Taipei, May 7 (CNA) High-seas training will become a fixture in the training of China’s battle group headed by the aircraft carrier Liaoning, with exercises expected to expand to the "second island chain" in the Western Pacific, Taiwan’s defense minister said Sunday. 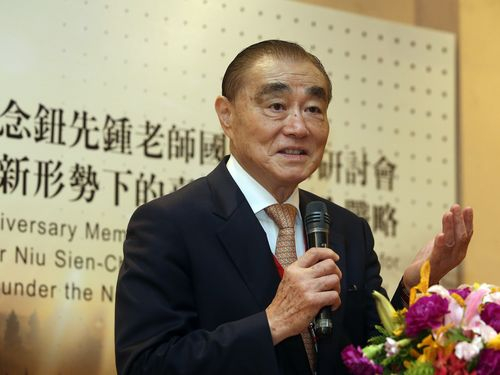 Feng Shih-kuan (馮世寬) made the remark in a speech at the opening of Tamkang Strategic School’s annual assembly in Taipei. He predicted that in the future, the Yellow Sea and the East China Sea will no longer satisfy Chinese aircraft carrier battle groups as sites for military training. As high-seas training becomes more regular, Chinese military exercises are expected to expand to the second island chain that comprises the Bonins, the Marianas, Guam and the Palau archipelago, Feng said. Concerns over China’s military expansion have arisen after the Liaoning and its carrier strike group were reported moving through the "first island chain" during training in late December 2016. The first island chain refers to the first chain of major archipelagos out from the East Asian continental coast, and comprises the Kuril Islands, the Japanese archipelago, the Ryukyu Islands, Taiwan, the northern Philippines and Borneo. The island chain strategy was first brought up by American foreign policy commentator John Foster Dulles in 1951 during the Korean War. It is now often used in political and military analysis concerning China’s military movements in the Western Pacific. Japanese media have reported that the Chinese navy and air forces have frequently entered the Western Pacific in recent years through the Miyako Strait northeast of Taiwan for high-seas drills. Feng said China’s military strength has become more and more strong over the past two decades, during which the training of its battleships and aircraft has expanded from coastal waters to the seas near the mid-line of the Taiwan Strait. Now, the Liaoning aircraft carrier and H-6 fighter jets can already break through the first island chain to the waters east of Taiwan, Feng said. "Every time their high-seas training involves a voyage passing Taiwan, it puts great pressure on our military, forcing us to raise combat readiness," he said. Given the new developments, Feng said he believes Beijing will not stop its military intimidation of Taiwan, which it regards as Chinese territory. Taiwanese people should see clearly the situation and be prepared for any possible threats, he suggested. The minister also said Taiwan has been keeping its political promise of maintaining the status quo in the Taiwan Strait and not provoking China. He expressed hope that Beijing understands that the world is changing and that international relations are more and more inclined toward democracy. He said he would like to see China adopting a global strategic point of view and developing cross-strait relations from a new and positive perspective.